The neoprene sleeve is the brain-child of G.E. "Moose" Detty, a Certified Athletic Trainer and a physical therapist. 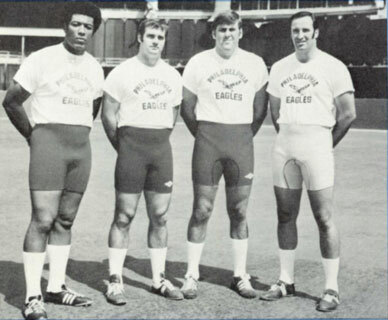 It was while Mr. Detty was the head athletic trainer of the NFL's Philadelphia Eagles that he perfected the neoprene sleeve, designing many products for his Eagles players, that are still in use today. Noted for their advanced designs and construction techniques, you can find PRO products at all levels of competition. From little league to the Olympics and all types and levels of school and professional sports. Today, PRO neoprene supports can be found in use in thirty-four countries around the world. Use is no longer limited to athletics. With today's active population, health care practitioners of all types use PRO products on their patients. From simple strains to post-operative therapy, orthopedic surgeons to the family practice specialist, the physical therapist to the chiropractor, PRO products are an active part of their injury treatment regiment. With over 50 years of design and manufacturing experience no one knows neoprene better than PRO. Offering over twenty patented products, PRO is constantly upgrading designs and materials to give you the best support possible. While many new materials have entered the market, none can produce the results obtained with neoprene. It is the four-way stretch properties of neoprene, combined with the therapeutic heat retention, that make neoprene so effective in controlling edema. Compression alone cannot produce the same results. And all PRO neoprene products are latex free. Unlike most of the providers in the marketplace today, PRO still manufactures products in the United States in a state-of-the-art facility in Tucson, Arizona. Unlike the importers, PRO can provide additional services such as custom fabricated sleeves and supports for those hard to fit patients. Try PRO and see why quality, innovation and service have become the hallmarks for which we are noted.